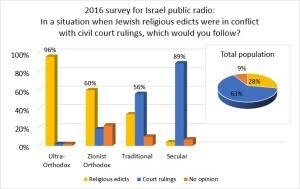 Two weeks ago, the RRFEI bulletin [link] included an analysis of the Supreme Court landmark ruling on access for non-Orthodox converts to public mikva’ot, demonstrating that there is a lot more to this than first met the media’s eyes. 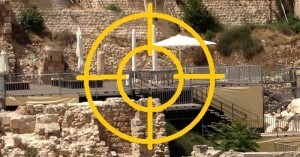 We reported on the immediate, horrific backlash from ultra-Orthodox circles. The three religious parties (namely the Zionist Orthodox Jewish Home and the two ultra-Orthodox parties) have joined forces in submitting a legislative proposal that would undo the Supreme Court ruling. This is their attempt to grant absolute control of the publicly funded mikva’ot to the Chief Rabbinate. As Hiddush has noted [link], this is yet another case of Dr. Jekyll / Mr. Hyde syndrome, exemplifying the Jewish Home party’s head & Minister of Diaspora Affairs Naftali Bennett’s split personality. He goes out of his way to appear inclusive, tolerant and pluralistic outside of Israel, to you, our friends and colleagues in North America; but he has no problem swerving 180 degrees when it comes to our non-Orthodox colleagues, converts and movements in Israel. An important, further development occurred in the last few days, as the Chief Rabbinate publicly turned to Israel’s religious councils that operate the public mikva’ot [link in Hebrew], instructing them not to abide by the Supreme Court ruling. 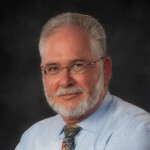 What was self-evident to the Supreme Court, as Hiddush indicated in its analysis [link], namely:“the rabbinate is not authorized to establish a discriminatory policy” is not only not self-evident to the Chief Rabbinate (a state organ established by civil law and subject to the rule of law! ), but it openly and rebelliously flaunts this! We have repeatedly suggested that the battle over religious freedom and equality is not merely a battle over religious diversity, but is -at the core- a battle over the rule of law and democracy. 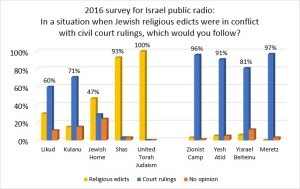 The Chief Rabbinate’s gall is but another compelling demonstration of the serious problem we face. 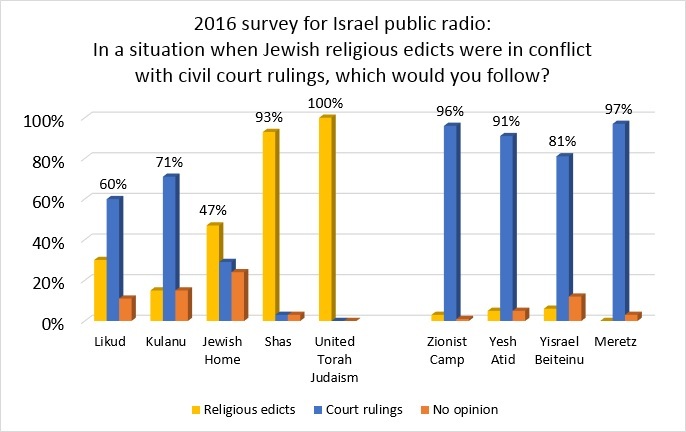 We would like to share with you another dimension of that very challenge; it so happens that this week the Israeli public radio commissioned a poll, which included the question “In a situation when Jewish religious edicts were in conflict with civil court rulings, which would you follow?” Looking at these graphs (above), we get a quantitative perspective of the extent of the challenge. 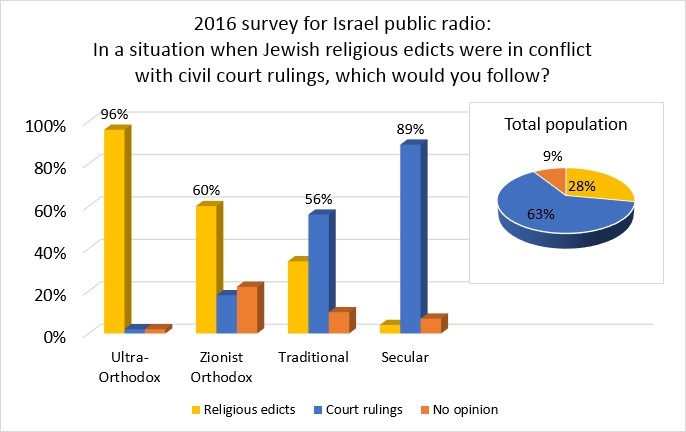 While the overwhelming majority of Israeli Jews respect the law, the ultra-Orthodox and most of the Zionist Orthodox indicate clearly that they would view the civil court’s rulings as merely advisory, not to be adhered to, in the case of such a clash. Obviously there would be instances in which all of us would maintain such a position. For instance, if, under unimaginable circumstances, the court ordered the public to violate the Sabbath or eat treif… But these are NOT the questions that come before the judicial bench. The mikva’ot case (as an example) involves state funded public mikva’ot, and their use by non-Orthodox converts does not make them impure, regardless of whether the Rabbinate likes it.